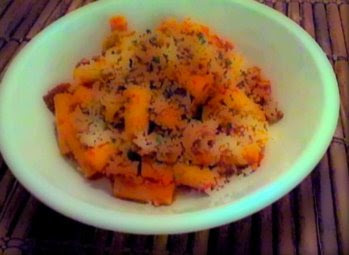 Food Wishes Video Recipes: Don't Call it Daffy - Duck Leg Ragu! This video recipe was filmed over a year ago (with a webcam duct-taped to a spice rack), and was never posted here due to what I thought was a corrupted file (and no back-up). I won’t bore you with the technical details (which means I'm not sure how I did it), but I was able to extract the video and do a new voice-over. Unfortunately, there were no photos of the dish, which explains the screen shot, with watercolor filter applied, seen here. As I say in the video, duck legs are such great meat. They are cheap, rich tasting, easy to work with, and if you do some research, you'll learn that duck fat is actually not such a bad thing. I doubt your local grocery store sells them - instead you'll find whole frozen ducks, which will work in a pinch. But, if you call a meat market, or restaurant supplier, they can easily order a box of frozen duck legs for you. I get mine at a local SF meat wholesaler for about $3 a pound. They really are delicious, and well worth the trouble searching for. Hey, you can probably even order them online. Here, I'm using them in place of pork and/or beef, in a fairly straightforward meat sauce recipe. Another great thing about the legs is the magnificent skin. I love it fried to a crisp, chopped up, and dusted on top of my pasta. A stunning contrast in texture and flavor. Enjoy! I'm getting "Sorry, this video is no longer available" when trying to view. Maybe I need to have the actual duck legs before it'll play? it seems to be fine. youtube does that sometimes. also, i'll do the jokes. Nice, I love duck, I think its the most delicious, succulent, tender meat out there... Hey Chef, you live in Cali right? You should go get some of those hanging roasted ducks in san fran, there awesome! Can you substitute the white wine with a marsala or madeira? to me those wines would be a bit too sweet. Maybe I have freakishly strong fingers, or weak duck! Don't worry, it doesn't matter what they look like. Just make sure you cook until the meat is falling off the bone. The sauce will taste wonderful! thanks chef john for the recipe! i couldn't find duck legs (even at european meat market) so i used chicken legs instead - and i used penne instead of rigatoni... so really i made chicken leg penne. haha.. but it was sooo delicious still and got rave reviews from roommate and boyfriend. "how did you make the sauce? this doesn't taste like you threw in the regular pasta sauce!" sounds great...You've made me very proud! Can I substitute the white wine for anything else. leave the wine out if you want. Or a very small splash of wine vinegar. Can I use whole duck instead, if I cannot get the legs? yes, whole duck is OK, just more work. Who's your sf meat wholesaler?